The Empire Brass enjoys an international reputation as North America's finest brass quintet, renowned for its brilliant virtuosity and the unparalleled diversity of its repertoire. The five musicians - all of whom have held leading positions with major American orchestras - perform over 100 concerts a year in cities such as New York, Boston, Chicago, Washington, London, Zurich and Tokyo. With their best-selling recordings on the Telarc label they have introduced an even larger audience worldwide to the excitement of brass music that ranges from Bach and Handel to jazz and Broadway. They are equally at home in the majestically antiphonal works that Gabrieli composed for St. Mark's Cathedral in Venice and the exuberantly show stopping tunes that Richard Rodgers and Andrew Lloyd Webber wrote for Broadway. The Empire Brass is the first brass ensemble to win the prestigious Naumberg Chamber Music Award. In addition to playing across the United States, the Empire Brass has toured the Far East thirteen times, and performs regularly in Europe, twice in Rome within the past eighteen months. It has played to standing-room crowds in the former Soviet Union, where its concerts were broadcast on television. The ensemble has performed with major symphony orchestras such as the Chicago Symphony, Boston Symphony, the Philadelphia Orchestra, New York Philharmonic, Toronto Symphony, Detroit Symphony, Cincinnati Symphony and Zurich's Tönhalle Orchester. It regularly visits leading summer festivals including Ravinia, Tanglewood, Caramoor, Saratoga and Chautauqua. 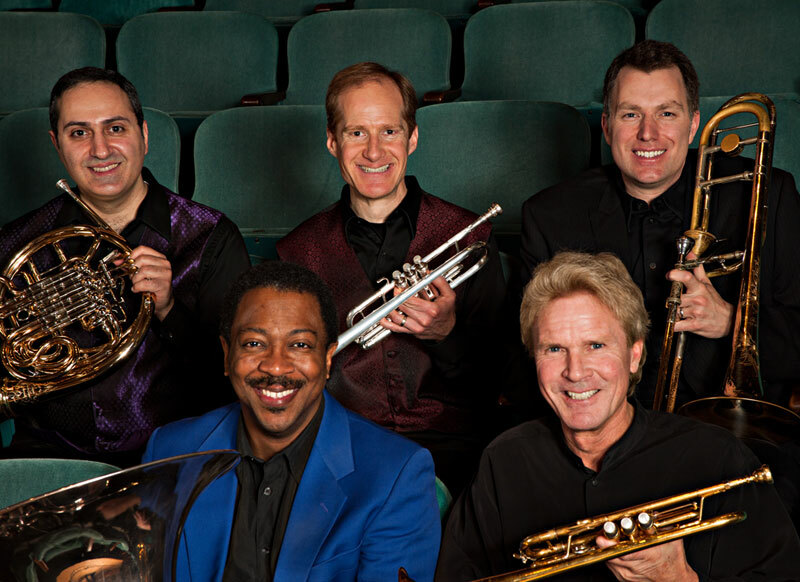 On network television, the Empire Brass has been featured on CBS's Good Morning America, NBC's Today Show and Sunday Today and PBS's Mr. Roger's Neighborhood. It is a regular guest on commercial and public radio networks nationwide, performing on programs such as St. Paul Sunday Morning, Traditions and NPR's Performance Today. In December 1987, the Empire Brass became the first ensemble to play at the newly remodeled Carnegie Hall. It also opened the Carnegie Hall Centennial Gala joining forces with members of the New York Philharmonic in the world premiere of Joan Tower's specially commissioned Fanfare for the Uncommon Woman. The Empire Brass has served as Faculty Quintet-in-Residence at Boston University for thirteen years, led the Empire Brass Seminar at the Boston University Tanglewood Institute for over twenty years, where students from around the world, including such musical capitals as Vienna and London, come to study with the five musicians. In 1991 it began a new appointment as Visiting Consultants in Brass at London's Royal Academy of Music. It also leads an annual series of college clinics co-sponsored by the Selmer Company, maker of the Empire Brass' instruments. A series of best-selling CD's on the Telarc label offers music that spans five hundred years from a dozen different countries. The most recent of these are Romantic Brass , an anthology of Spanish and French music;Brass on Broadway ; and Class Brass - On The Edge , featuring works from Khachaturian, Prokofiev, Bernstein and Copland; and Mozart For Brass , arrangements of Mozart works by Rolf Smedvig. Passage , arrangements for brass and percussion of music from 138 B.C. to 1611 A.D. and is an original concept of the Empire Brass' founding member Rolf Smedvig, with the collaboration of the electronic percussionist Kurt Wortman. The disc includes arrangements of works by Hildegard von Bingen, Hans Weck, Francesco Landini and Carlo Gesualdo. The latest release on the Telarc label is King's Court and Celtic Fair , is an enchanting collection of works that explores the two musical worlds of old Europe in new arrangements featuring the use of electronic percussion. Flavored by the proud traditions of Scotland (complete with bagpipes), the Empire Brass and friends musically capture the lighthearted merriment of a peasant Renaissance fair and give upbeat performances of court music of the 16th, 17th and 18th centuries. Selections from this recording include a haunting bagpipe rendition of Amazing Grace, Hamelin Gigue, Sarabande , and music of Byrd, Scarlatti, Purcell and Rameau from the European Renaissance. This music, with its lively and infectuous rhythms, transports the listener to the land of magic, joy and fun.